Way back when, my introduction to working on clocks came about because a clock shop could not repair an anniversary clock I had bought from them. Sure, they tried, but after taking it back 7 or 8 times, I finally decided to look at it myself. And, even at that early point in my clock career, it was pretty obvious that it should tick evenly. So, after figuring out to check the over-swing on each direction of rotation, and making rather minor corrections to the orientation of the suspension spring, I had a clock that ran great. Yup, that was my introduction to clocks. And, while I later amassed over 100 of the more interesting examples of Anniversary Clocks, disc pendulums, globes, tomb-stone dials with date and day of the week, unusual cases, even a wall clock, it was all due to the inability of a clock repair person to repair one of these gems that got me into clocks! Interestingly, it is because of the same repair person – let’s call him Walter, to protect the innocent, or whatever, anyway, a couple of months ago I get a call from a car bud who has this anniversary clock that wouldn’t run. And, it had deep sentimental value. And he had taken it to two shops already and it still wouldn’t run. And, you guess it, one of the people was Walter. The other is immortalized in my mind as the only person I have ever found who will bush every hole on an anniversary clock. But, that is another story. The owner wanted to know if I would look at it? OK, the kicker was, he was willing to pay $500 to get it running. At least he now had my attention. It turned out to be a rather nice example of the Jahresurenfabric clocks with the 49 in a circle on the back plate. This one was one of those with the off-white painted trim, with the small flowers… And, they had bought it on their 30th wedding anniversary. After fixing all the obvious problems (bent pivot on the escape wheel, 0.003 instead of 0.004 spring, suspension-spring fork gapped way too wide, properly restoring the pivots - it looked like they had been “polished” with fine emery paper, so had to be stoned and burnished, and, of course, putting it in beat) and giving it a good cleaning, it would run for a while, but not keep running. 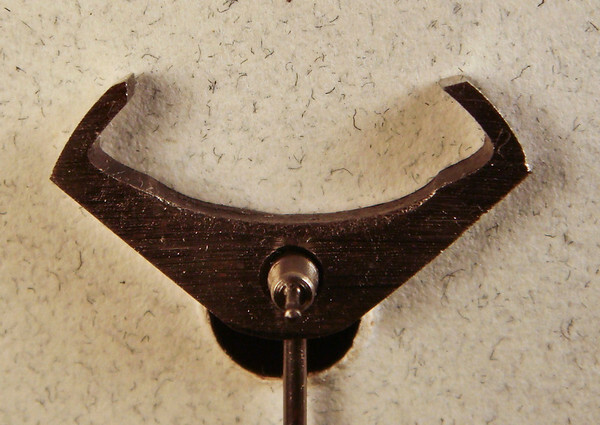 It ran fine with lots of over swing (like ¾ turn), but when the pendulum slowed down to a more expected over swing of around a quarter turn, it kept wanting to flutter on one side of the swing – the escape wheel tooth would fall on the dead beat face of the pallet, then recoil back far enough to slide onto the impulse face. Almost like the pallet face had the wrong angle. Well, the adjustable pivot for the anchor had been mucked with (oh why, oh why do people have to try to adjust the depthing of the anchor? A good rule or thumb – the anchor does not need adjusted. This is similar to rule 2 - the anchor does not need adjusted, and rule 3 – the anchor does not need adjusted!). So, I worked with it for a bit, but to no avail. The clock would not keep running. I had noticed when first inspecting the clock, that the end of one pallet looked like it had been rounded over a bit. The first attached photo shows the original anchor – hopefully you can see that the left hand pallet doesn’t have quite the right shape. If not, check out the next photo – a close up of the pallet. But, that was not the pallet that was giving me fits. It was the other pallet. At least that was my logic at that point. And, sure, the other pallet showed signs of having been buffed on the dead beat face, but it didn’t seem that bad. Which, I suppose could generate my fourth rule of thumb for working on anchors – Don’t buff the faces of pallets. If they need worked, re-cut them to match the original shape and angles. Don’t just buff away and expect them to work. Well, after spending 30 to 40 minutes a day for 2 weeks, I put out the call to my clock buds to see who had a spare mechanism that I could try parts from. Thank you Herschel! Put in a different anchor, and zowie – the clock runs perfectly.